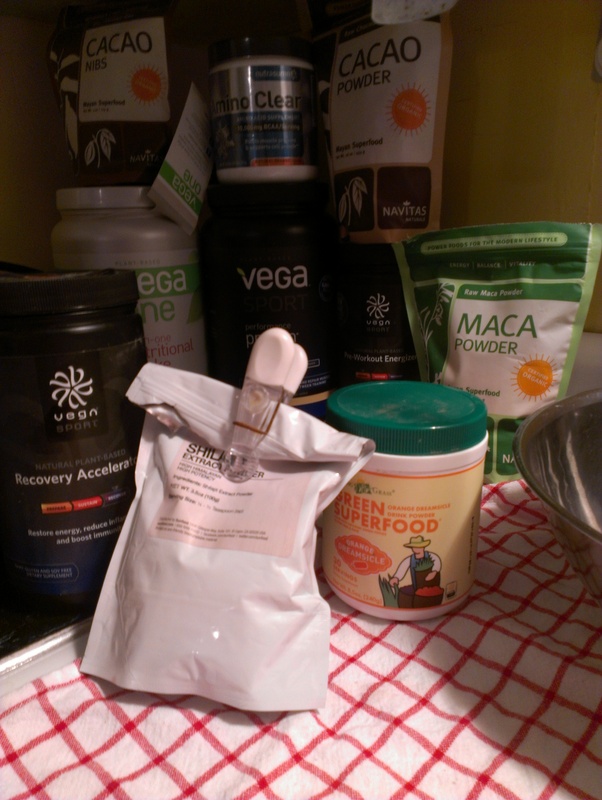 Last week I stopped by VitaminShoppe in search of the new VegaOne Bar. To my dismay, they are not selling in retail stores yet so I must wait longer since I refuse to pay $50 for a box 0f 12 without tasting one! And I LOVE Vega. 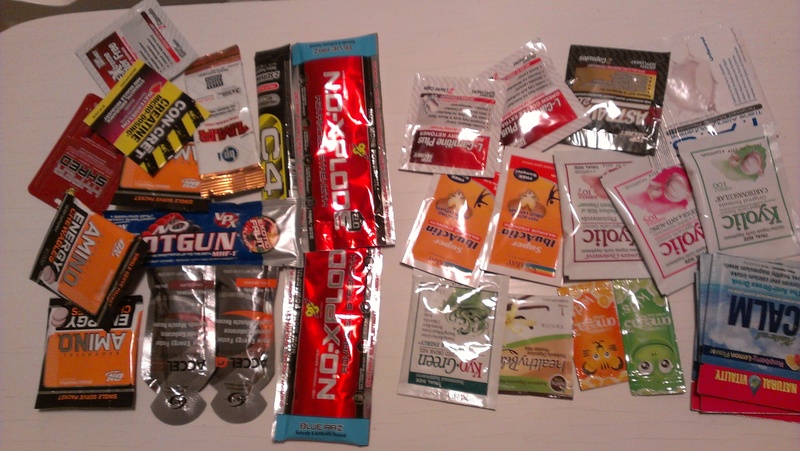 So I asked the cashier if he had anything else for sample, and he grabbed me a goodie bag of the stuff pictured above. As I sorted things out, I quickly realized the difference in the marketing, packaging, and names of the products. On the left there you can see things like “N.O. Explode, Energy, Hyper, ShotGun, Accel, C4, Concrete, Jitter, and Shred.” They are named after explosives and manly things, and are packaged in bright eye-catching colors. Men really need to be impressed with a package in order to buy something. Do they think the more radical the name, the brighter the color, the better it works? I hope they are smarter than that! The women’s supplements are named, “Omega, Calm, Natural, Fat Loss, Healthy, Green.” I must admit, they are NOT sport supplements like the men’s obviously are. But still, notice the colors/names and make your own assumptions. Now as you see on the right, a lot of white and light colors, minus the one black package which could have been sorted with the men’s, but because of it’s ingredients and stance, I sorted it with the women’s. So I usually don’t consume or buy anything that isn’t organic, holistic, or vegan, but since I got all this stuff for free, I was like, eh, why not? If I’m going to harshly judge them, I might as well give a few a shot, or even a taste. I just want to make this point: Supplement companies pay a lot of money for their products to be marketed to specific types of people. Do the research on the ingredients. Find pure and organic sources. And don’t trust the claims!!! Natural Calm This stuff rocks. Natural Calm Magnesium. 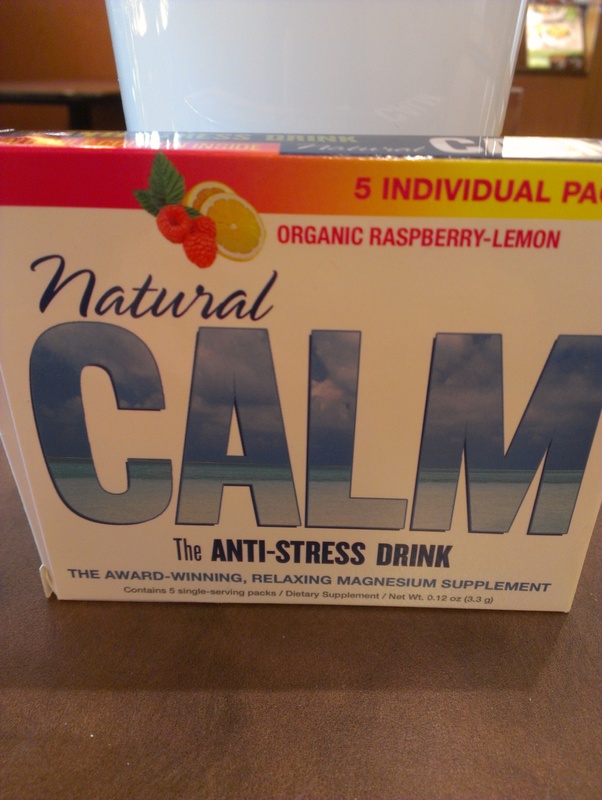 A total of 0 calories, lots of flavor, and a true relaxing effect. It’s a magnesium supplement in the form of a drink. I usually sip on Airborne or Emergen-C, so this was right up my alley. It came in little powder packets and was easy to mix into hot or cold water. I used it one night as my hot tea since I was out, and honestly PASSED OUT. It really does calm you down! I researched magnesium and realized I do eat some foods where it is naturally found, but most people DO NOT get enough in their diet. I’d suggest it to anyone looking for a tasty drink, who needs some magnesium and a calm response. Go Nature! C4: Today I tried the C4 supplement for my HIIT workout. The taste was reminiscent of Kool-Aid as a child, fruit punch. Not too sweet, not too acidic. It’s called a pre-workout supplement, but I put it in my gym water for flavor, and drank it as I did my 35 minute HIIT routine on the elliptical. I liked the taste and it definitely gave a boost of energy. A huge downfall was that it made me itchy like crazy. I would never take this again, and I only put half the sample in my 28oz Blender Bottle. Reviews online claim the itchiness and tingly sensations are normal and from the beta-alanine. Some say it pumps them up even more, but it made me just want to itch. I don’t like getting itchy. No Thanks! N.O.Explode: Sunday night I put about a tsp of the N.O. Explode in some water, just to see the taste and what all the hype was about. I know people claim this is “the best” out there. It’s full of a bunch of stimulants, and honestly I felt it. I drank about a total teaspoon or two and felt the caffeine rush from this drink. Yes, it does taste like a blue raspberry pixy stick, but I wouldn’t buy it because of all the crap in it. I’ll stick to my organic supplements for energy. I do admit, the caffeine is crazy quick and strong, but I’d rather not submit my body to that kind of thing daily. 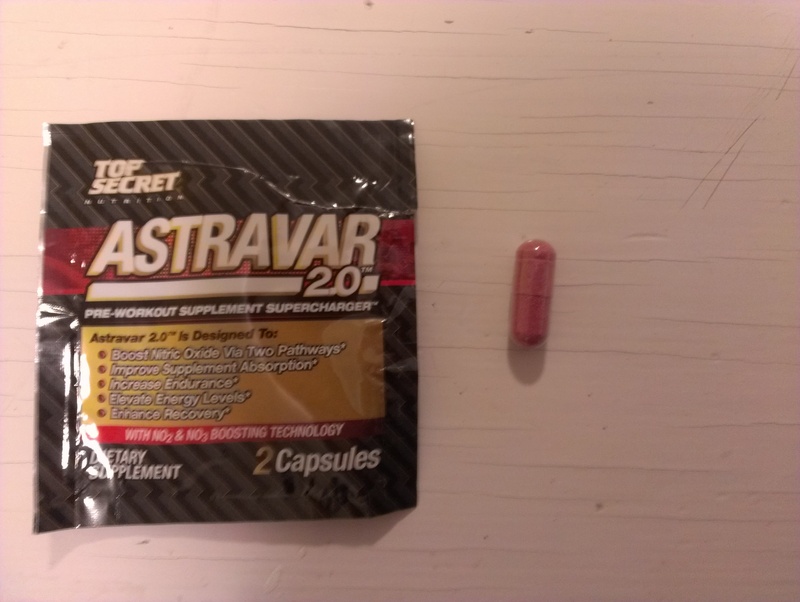 If I’m training un-fasted, I’ll use my natural Guarana, Matcha, or Vega Pre-Workout Lemon-Lime drink. Clif Builders: I’ve been reading a ton of literature on training, muscles, and recovery. 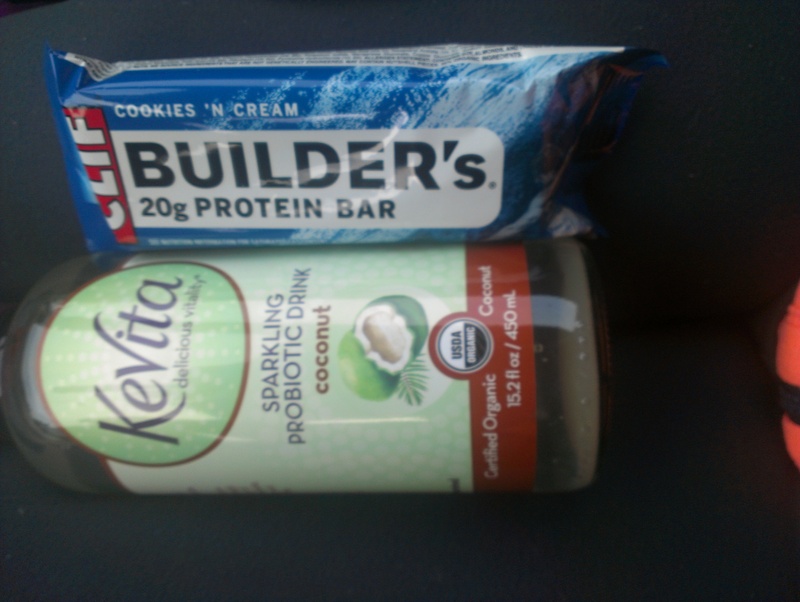 Last night I saw this Clif Builders bar suggested to people on vegan diets to supplement their protein. With my 3-4x week weight lifting and High Intensity Interval Training sessions, I should be taking in about 1g/lb of body weight in protein daily. That’s roughly 100-110 grams! That’s a lot for me, since I do intermittent fasting and eat in an 8hr time frame. *I tried the HealthyBody fiber and it blended well into my yogurt. I didn’t taste anything, and I didn’t feel any effect of the fiber. *I tasted the OmegaOrange supplement marketed towards kids/moms as a yummy omega 3, and it tasted GROSS like fish. Ew. *I tried a tablet of the AminoEnergy and they tasted like baby aspirin. They contain caffeine, so I’m sure they give a kick, but the aminos in them aren’t even BCAA. Lame. *My boyfriend tasted the AccelGel and said it was pretty tasty; he didn’t consume the whole supplement, nor was interested in doing so. Question: What supplements do you take? What are you interested in trying and why? Do you think they are all a gimmick?